Six cities around Australia have developed collaborative visions of what a water sensitive future looks like for them and are now working to implement these. Briony Rogers and Katie Hammer give an update on the initiative and the early lessons for cities elsewhere. In Australia, the Millennium Drought, which parched the country for the first decade of the new century, left cities such as Melbourne a year away from running out of water. The drought was broken by a period of intense rainfall, with cities such as Brisbane suffering major floods that caused billions of dollars’ damage. Townsville recently suffered extreme monsoon conditions, with dams reaching more than 200% capacity and triggering floodgates to open, causing extreme flooding for thousands of residents – this after several failed wet seasons and record breaking low dam levels in 2017. Australia as a whole has experienced a record heatwave this summer, with temperatures reaching 49°C in some parts of the country. Coupled with these climatic extremes, urban populations are surging, with cities such as Sydney adding almost 2,000 new people each week, challenging the provision of infrastructure services and local amenity. Without proactive and urgent transformation, future Australian cities will fail to support the health, wellbeing and prosperity of their citizens. Fortunately, there is a way forward. If the emerging vision of water sensitive cities is realised, the country will lead the world in transforming urban areas to ensure long-term liveability, sustainability and resilience in the face of climate change and urbanisation. In the water sensitive city, water system services are critical for enabling broad aspirational outcomes for a city, such as healthy people and places; thriving, protected ecosystems; sustainable, efficient resource use through adaptive infrastructure; and innovative and strong economies (see box). While there is not yet a water sensitive city in the world, the concept has captured people’s imagination as a way of recognising the centrality of water for thriving future cities. In many places in Australia, the water sensitive city is becoming embedded as a strategic objective. However, creating water sensitive cities is challenging. It requires a significant departure from conventional modes of water servicing – typically involving large-scale, centralised pipe networks designed to address single objectives of water supply, sewerage and drainage. These types of networks remain important in a water sensitive city; however, delivery of broader benefits will require the integration of decentralised and nature based technologies that are efficient, flexible and adaptable, and designed in a way that is sensitive to local urban environments and responsive to the community’s values. Transitioning towards the water sensitive city vision will, therefore, need significant changes to the structures, cultures and practices that underpin the planning, design and management of water systems and urban developments. A research project by the Cooperative Research Centre for Water Sensitive Cities (CRCWSC) brought together leading strategists, policy-makers, practitioners and academics in six cities around Australia – Perth, Sydney, Adelaide, Townsville, Gold Coast and Bendigo – to detail local visions for their water sensitive city and develop transition strategies to guide the changes needed to make their vision a reality (see box). The value of a future vision comes when it is sufficiently compelling to align stakeholder actions, orient investments, and motivate and sustain the significant shifts needed for its realisation. So each city’s vision needed to go beyond thematic headlines to draw out the unique local contexts that will influence how water sensitive city principles would manifest, creating an inspiring image intimately connected to local place. Townsville’s vision reflects pride in its dry tropical identity, embracing the dramatic water cycles of the region and emphasising the importance of the Great Barrier Reef for local water management practices. The vision for Perth, where rainfall is declining in step changes, emphasises the importance of a climate independent water supply and the role of community stewardship beyond water saving behaviours. Sydney, Australia’s largest city, highlights the variation in what constitutes ‘liveability’, going from east to west across the city, and calls for a more integrated, collective approach to water management. The vision for Gold Coast, famous for its coastline and canal network, emphasises the significance of water for people’s lifestyles through recreation and local amenity. Adelaide articulates a vision of water driving a strong economy, putting the city in a strong economic position nationally and internationally. Finally, the vision for Bendigo – an inland city in regional Victoria – highlights the role of its connected and active community, including the local Aboriginal Dja Dja Wurrung Traditional Owners, in delivering water sensitive outcomes. While these visions have been developed in Australia, the ideas and aspirations they represent are relevant globally, and may provide a starting point for cities elsewhere to consider their future water systems. Generating commitment to a vision over the long term requires people to feel a sense of local ownership, stewardship and pride for what it represents. So the envisioning process is important, involving activities to explore people’s connections to their place, their experiences with water, and their emotive responses to local water related events and trends. Australian cities are now considering how to drive the on the ground changes needed to achieve their vision. This is no mean feat, particularly when we consider the vast range of new practices that our research participants identified as being necessary for their city’s water sensitive transition. For example, water system and urban planning will have to become more integrated to achieve service outcomes that link to a broader vision of urban liveability and environmental health. Infrastructure will also need to be designed to meet additional objectives beyond its engineering function. Governance structures, processes and capacities will have to enable and drive collaborative, long-term, cross-sectoral and inclusive planning and design solutions. Community engagement practices must be meaningful and transparent, focused on empowering citizens to have the interest, capability and opportunity to be active partners in achieving water sensitive outcomes. Opportunities to engage with Australia’s Traditional Owners will need to be fostered, respecting their traditional custodianship and harnessing their knowledge, cultural values and ways of thinking to support water sensitive city outcomes. The scholarly field of sustainability transitions teaches us that such significant, system-wide transformation is likely to take decades, as new water sensitive practices are established and replace old ones. CRCWSC research on water sensitive city transitions has identified five critical factors that create an enabling context for accelerating these shifts. These five factors form the basis of a diagnostic framework developed by the CRCWSC: the Transition Dynamics Framework (TDF)1. The TDF was used in this research to examine the social and institutional context of the six participating Australian cities, assess the presence or absence of key enablers, identify opportunities for accelerating their water sensitive transitions, and then prioritise strategic actions for driving change. A clear suite of common transition priorities emerged across the six cities. Champions: These are the individuals, organisations and networks that provide collective leadership and mandate for change. A broad community mandate for pursuing water sensitive cities will help to establish political support and buy-in, and will build the capacity of professional champions to be influential. Communities need to be empowered to be active water sensitive citizens and grassroots champions. Platforms for connecting: These are the organisations, structures and processes that facilitate collaboration across science, policy and industry. Governance frameworks that enable coordination are needed, as well as strong informal relationships and networks among diverse stakeholders. Mechanisms for sharing data and knowledge to support learning and collaboration are important. Science and knowledge: New portfolios of specific solutions for managing local groundwater, empowering communities and incorporating Aboriginal knowledge and values are needed. System based knowledge and evidence – for the holistic assessment and quantification of water sensitive city benefits and costs, for example – is also required. Projects and applications: Consolidation and sharing of lessons from existing water sensitive city initiatives would be of immediate value. It would also develop an explicit learning agenda and strategy to guide identification and implementation of trial and demonstration opportunities. Trials of emerging technical, collaborative governance and community empowerment solutions are needed, and long-term monitoring and evaluation will help to improve system design and performance. Administrative and practice tools: The cities need to ground their water sensitive vision in local community values and priorities. Organisational cultures, systems and processes that enable and encourage innovations must be fostered. Integrated decision frameworks and modelling tools are needed, accompanied by inclusive processes and new business models that support the sharing of costs, benefits and risks across public, private and community partners. Data and knowledge sharing must be supported through new software platforms. This list of priorities forms an ambitious transition agenda for Australian cities, and stakeholders are now focused on implementation planning. Some priorities need capabilities, incentives and resources to be mobilised, while others require further evidence and the development of frameworks, methods and tools. Key to implementation will be the collective commitment of local industry, starting with the people and organisations involved in our visioning and transition planning processes. Participants have formed Water Sensitive City Transition Networks, informal governance structures that have a strategic focus on strengthening relationships, sharing knowledge, identifying cross-organisational opportunities, influencing governance processes, and sustaining their water sensitive city transition momentum. The vision of water sensitivity is a bold but important direction if cities are to continue to thrive in the face of climate change and urbanisation. However, the transition challenge looms large – and may even appear insurmountable. Yet there is plenty of reason for optimism when there is a shared vision and a commitment to collective action. With the help of collaborative processes and diagnostic tools – such as those developed in our research – we are confident that stakeholder momentum can be catalysed and strategic action designed to drive the practice changes needed to accelerate water sensitive city transitions across Australia and the world. Dr Briony Rogers and Katie Hammer are with the Cooperative Research Centre for Water Sensitive Cities and the Monash University School of Social Sciences, Melbourne, Australia. Note: 1 Brown, R, Rogers, B, Werbeloff, L (2016). Moving toward water sensitive cities: A guidance manual for strategists and policy makers, Melbourne, Australia: Cooperative Research Centre for Water Sensitive Cities, watersensitivecities.org.au/content/moving-toward-water sensitive-cities/. The concept of a water sensitive city is an urban water management approach that delivers benefits to enhance sustainability, liveability and resilience. A water sensitive city is based on holistic management of the water cycle to deliver basic services of supply and sanitation, while mitigating flood risk and protecting and enhancing the health of receiving waterways. It uses water management to deliver better health and wellbeing outcomes, and recognises that a water sensitive approach to urban development can deliver objectives critical to the liveability of a city, such as biodiversity, connected communities and cultural significance. A water sensitive city incorporates innovative infrastructure, design and governance solutions. Water recycling at different scales – through wastewater recovery and stormwater harvesting – provides a diversity of sources and improves the health of rivers and creeks by reducing pollution and flow impacts. Nature-based infrastructure, meanwhile, is integrated into the landscape to offer hydraulic and water treatment functions, plus benefits such as an aesthetic environment and mitigation of the urban heat island. Integrated and collaborative land use and water planning results in catchment scale approaches to flood resilience and connecting areas to create ecosystem and recreation corridors throughout the city. The Cooperative Research Centre for Water Sensitive Cities carried out an Integrated Research Project (IRP1: WSC Visions and Transition Strategies) aimed at developing tools and processes to guide cities to become more water sensitive. It applied an action research methodology, whereby stakeholders contribute to knowledge co-production with the research team through workshops supported by supplementary engagement and analytical activities. 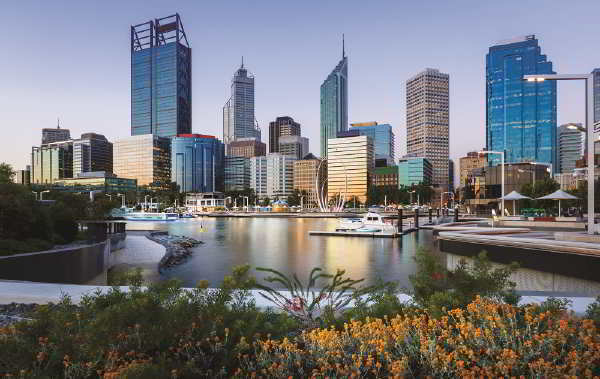 Planning processes were run in six cities across Australia – Perth, WA; Adelaide, SA; Bendigo, VIC; Sydney, NSW; Gold Coast, QLD; and Townsville, QLD – to develop local water sensitive city visions and transition strategies. The design and data analysis drew on theories and frameworks from an emerging body of research focused on navigating transitions towards more sustainable futures. Each workshop series involved strategists, policy-makers, practitioners and academics from the water, planning, environment, and development sectors. In the Bendigo case study, visioning workshops were run with members of the community, which built on a pilot in Elwood, Victoria, as part of a previous project. Water sensitive city visions and transition strategies were created for each city. These articulate: a local water story; a 50-year water sensitive city vision; an assessment of current performance using the CRCWSC’s Water Sensitive Cities Index; and tangible strategies and actions for achieving the vision.